Is Fescue Poisonous to Rabbits? Can Fescue Grass Grow in Sandy Soil? Clumping fescue can be a pain when it makes its home in your lawn. Those unsightly clumps are notoriously hard to get rid of, and hand weeding rarely does the trick. To kill clumping fescue for good, you must treat it with an herbicide from March to April or September to October, when fescue grows the most vigorously. Mow, prune or burn the clumping fescue as close to the ground as possible. This gets rid of dead leaves that are not susceptible to the herbicide and allows new growth of susceptible leaves. Allow the clumping fescue to reach roughly six inches in height before you treat it. Determine how much herbicide you will need. A few clumps can be handled with a hand-held bottle sprayer. For more widespread infestations, you will need to purchase a concentrated herbicide and a 1- to 2-gallon pump sprayer. Mix the herbicide according to the manufacturer's instructions. This may be as easy as shaking a bottle sprayer or mixing a certain amount of herbicide concentrate and water for use in your pump sprayer. Spray the herbicide directly into the middle of the fescue clump. Try your best not to over-spray and affect desirable vegetation. If you accidentally kill a few blades of your lawn, don't worry. It will grow back in a few months. Wait a few days for the fescue to brown and die. If the clumping fescue pops up again, wait until it reaches six inches in height before applying a second application. Tall fescue grass, a popular cool-season grass, doesn't require much water or fertilizer, but grows best when a fertilizer with high nitrogen content, such as 29-0-5, is added. Nitrogen promotes leaf growth. When using agricultural nitrogen, apply 2-1/2 to 3 lbs. of nitrogen per 1,000 square feet of fescue lawn per year, divided into monthly increments (except during the summer, when fescue should not be fertilized). Allow the fescue grass to grow to a height of 6 to 12 inches. Herbicides work best when the fescue is actively growing. Cut the fescue grass back using a mower so that the grass is to the ground, and allow it to regrow between 6 to 12 inches in height. This causes the fescue to use a great amount of energy and allows for the greatest coverage of herbicide to healthy fescue and new growth. Apply the herbicide using a spray wand directly onto the plants during March or April, or between September and October. Allow the fescue to die away, and pull the plant up with your hands, wearing safety gloves. Considered a “cool season” grass, fescue thrives in cooler conditions and may turn brown during warmer months from excessive heat and limited water. When temperatures reach 90 degrees, the grass frequently goes into normal dormancy. Rhizoctonia brown patch attacks fescue lawns, particularly during warm weather with high moisture levels. 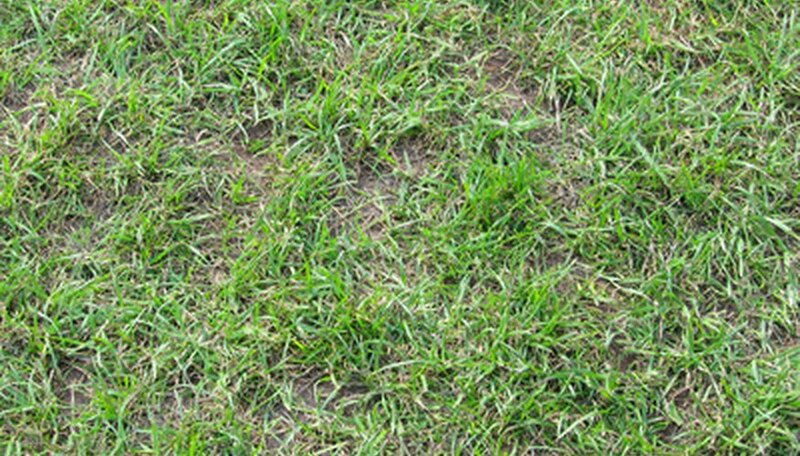 Brown patch tends to attack tall fescue more quickly and may damage the grass in as little as 24 to 48 hours. Circular patches normally start out looking purple and then quickly change to brown. Since fescue goes dormant in warmer months, landscapers frequently overseed with another grass adapted to warm-season growth. This blends the grass varieties and limits the appearance of brown turf. Although the fescue still goes dormant, the other grass keeps the lawn green. Grass seed that are best adapted for sandy soils in warmer climates include Bermuda, Bahia or Zoysia. For cooler climates, consider planting fescues, such as fine fescue, tall fescue or creeping red fescue. Prepare your lawn mower for the job at hand. Check the oil and gas levels. Check the lawn mower blade to see that it is sharp. Lawn mower blades should be sharpened or replaced at least yearly. Make sure the lawn is dry before cutting. Mowing wet tall fescue grass can introduce disease and fungus to the lawn, especially young seedlings. Cut your tall fescue grass at 2 inches high. You should raise this height a little higher during dry summer periods. Also, in areas of heavy shade the grass benefits from a higher cutting height. Cut your tall fescue grass again once it reaches 3 inches in height. By doing this, each time you cut you'll be removing one-third of the grass blade. This is the maximum you want to cut off at a given time. Seeds for tall fescue, fine fescues and bluegrasses are used in the north and east of Kansas. In the south and west, Bermuda, zoysia and buffalo grass are often sown. Tall fescue grows well in poor soil with low fertility and other issues. This grass develops deep roots to absorb moisture and nutrients. Tall fescue tolerates drought, foot traffic and salt. Do not over-fertilize tall fescue since it makes the grass susceptible to plant diseases. Till the soil up to a few inches to break up clods and incorporate topsoil with lower soils. Start this project in Fall to ensure best germination. Use the rake to even out the seed bed and remove any hills or dips. The idea is to make the smoothest surface for your grass seed. Remove any rocks and imperfections. Load the lawn seeder with seed and walk in even strips, releasing the seed. Go over the area again in the opposite direction to make certain it is evenly coated. Drag the rake over the seed bed to lightly coat the seeds with dirt. Strew hay over the whole area to keep seed protected from birds and wind gusts. It will also reduce water loss and problems with erosion. Water the seed bed daily until broad germination has occurred, about 14 to 21 days. Then water as needed or when soil feels dry to the touch. Fertilize in the Fall and mid-Winter. Use application rates recommended by the product manufacturers. Water in fertilizer well to prevent burning of foliage and roots. Mow the lawn as needed to keep it weed free and without clumps. Mow to 2 inches in fall and spring and 3 inches in the summer and in heavy shade. During peak growth this may mean mowing every five days. Mow your lawn, with the mower's height adjustment at the lowest level. Aerate your soil with a power aerator, which you can rent. Travel first in a north-south direction, and then in an east-west direction to ensure that you aerate the entire lawn. Sow the fescue seeds with a rotary drop seed broadcaster. Use the setting on the broadcaster to achieve a rate of 6 pounds per 1,000 square feet. Once again, seed north-south and then east-west for complete coverage. Aerate again or rake the seeds into the grass for positive contact with the soil. Cover your seeded area with straw, calculating coverage at 1 bale per 1,000 square feet. Water frequently. This will keep the seeds from drying out, and grass will start to grow in 8 and 14 days. When the seedlings reach about 1/2-inch tall, fertilize them with a slow-release nitrogen compound fertilizer. Before mowing, allow the seedling to grow about 1/3 higher than normal. Top-rated tall fescue turfgrasses include Matador GT, an improved cultivar that is greener, denser and more tolerant of both drought and wear than older tall fescue varieties like Kentucky 31, and Defiance XRE, a blend especially suited for golf courses and other areas of high wear. According to Ohio State University's Department of Horticulture and Crop Science, an endophytic fungus, or a "plant which grows within another plant," commonly infects the fescue plant. 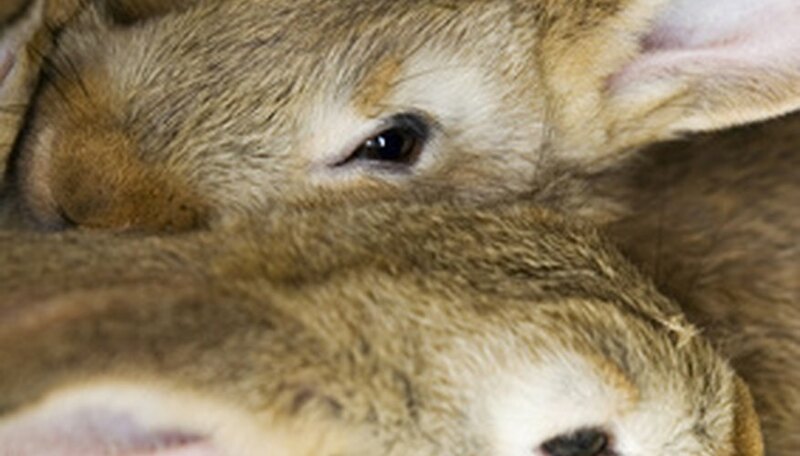 This fungus causes the fescue to create an alkaloid toxin that can poison rabbits. Look for signs of the tall fescue showing stress. You will notice the leaves slightly wilting or rolling. It may take on a purplish hue. Water your grass until 1 inch of water is put down on the lawn. A simple way to see how much water is being distributed is to set a short can or pan out in the yard. Water the grass until there is an inch of water in the can or pan. You will then have a timetable on how long to run your sprinklers each time. Repeat your watering once a week and run the sprinklers for the length of time you figured out in step 2. Water your fescue lawn once a week in the spring with about 1 inch of water for loamy or clay soils and ½ inch of water every three to four days for sandy soils. Water the fescue with 1 inch of water in the summer every time you water. Only water the fescue when it needs water, such as when the grass is wilting. If there is too much water run off, turn the sprinklers off for a few hours and then turn them back on for another few minutes so the grass absorbs the water properly. Water the fescue in the fall with 1 inch to 1 ¼ inch of water as it shows signs of wilting. Water sandy soil with ¾ inches of water every three to four days. Water fescue in the winter with 1 inch of water each time the lawn dries out. For cool season grasses, seed with shade-tolerant fescues, such as red fescue, tall fescue, and fine fescue, as well as bentgrasses. For warm-season grasses, centipeded grass and Zoysia are good seed choices for shady areas. Hand-pull patches of fescue grass in your lawn that are taller than 5 inches, and dispose of them in a plastic trash bag or compost bin. Spread newspaper over the patches of fescue grass that you wish to eliminate. Weigh down the newspaper with bricks or heavy weights. Leave in place for two weeks. The newspaper will kill fescue grass without the use of harsh chemicals that could damage the soil for desirable plantings after fescue has been eliminated. Spot-check the targeted areas on a weekly basis to ensure no new fescue growth is detected. If necessary, hand-pull new fescue growth and dispose of it into plastic bags or compost bin. Select a sunny location that receives six to eight hours of direct sunlight a day. Afternoon sun is preferred. Prepare the soil in the fall by tilling to a depth of 8 inches. Add organic matter such as well-rotted manure or compost to improve the texture of the soil and to improve drainage. Add one pound of a balanced fertilizer per 100 square feet. Plant in early fall or in spring after the danger of the frost has passed. Ornamental grass planted in spring has higher survival rates because the root system has time to develop throughout the summer. Sow seeds to a depth of a quarter inch spaced 3 to 5 inches apart. Cover with soil and firm down to remove air pockets. For mass planting, seeds can be broadcasted on top of the soil and rake lightly to cover. Water to moisten the soil and keep evenly moist until seedlings emerge in seven to 10 days. Reduce water to once a week once seedlings are several inches high. 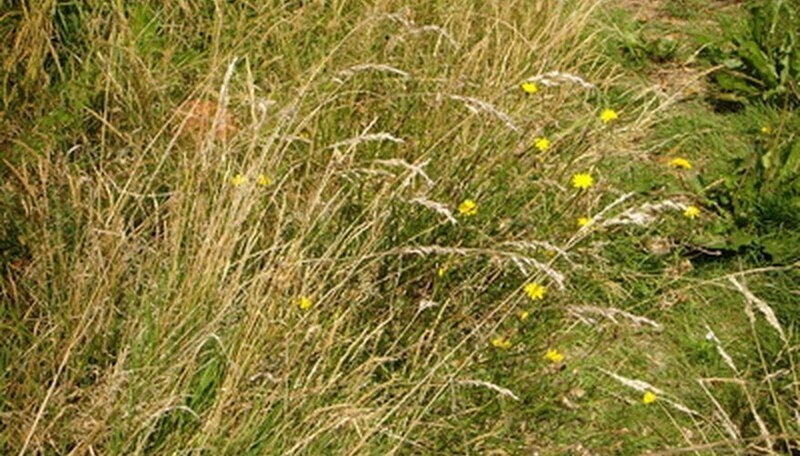 Remove blooms as they appear to maintain the rounded mound of fescue grass. 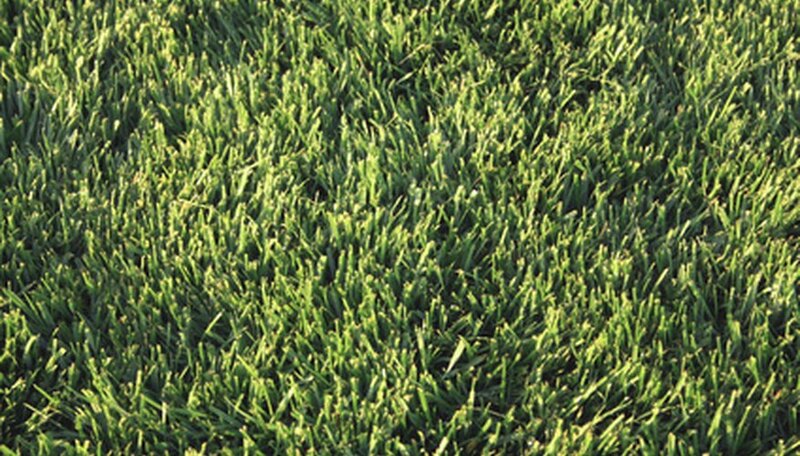 Fescue grass can be grown in sandy soil. Fescue is drought tolerant. Since sand drains fairy rapidly, any grass you grow in it will need to be able to handle extended periods of time without much water. However, you still should not expect a thick, lush lawn. Hand pull patches of unwanted fescue grass and place them into a plastic trash bag or compost bin. Allergy-prone individuals should wear gardening gloves at all times. Continue hand pulling patches of fescue until they are an even height (no taller than 5 inches). Spread the newspaper flat over the fescue to maximize its effectiveness. Spread the old newspaper over patches of unwanted fescue until they are thoroughly covered. Place bricks or heavy weights to hold newspaper in place for a period of two weeks. The newspaper will kill fescue grass naturally without the use of chemicals that could damage the growth of bermuda grass. Spot check the targeted areas of fescue grass on a weekly basis to ensure no new fescue grass growth is detected. Repeat the process of hand pulling and newspaper application, if necessary, to remove any future fescue grass growth.